We are moving on with very new keynote presentations, workshops, and book signings! PLEASE let us hear from you! If you or your group are interested in a presentation, book signing, or workshop contact us and we will get right back to you! If you are interested in any of our new material…go to EVENTS to read MORE! If you are interested please contact Terry! She is currently booking and working on a new schedule for us. 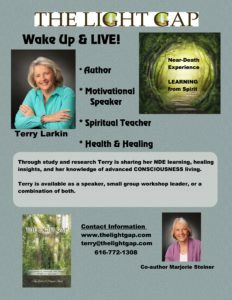 Terry Larkin can be reached at – terry@thelightgap.com OR Call 616-772-1308 and leave a message. She will get back to you as soon as possible! We are hoping to answer many of your questions and help in any way we can to make your life peaceful, meaningful and healthy in your own style. On our blog posts, we encourage you to make comments and ask questions there as well. EVENTS: Be sure to check out our Book Signing Events and Calendar tab on our HOME page. The Light GAP: God’s Amazing Presence Our Journey to Understand LIFE through LIGHT and Near-Death is now available through Amazon, Barnes & Noble and Balboa, our publishers. We will continue to write BLOGS and work to change and update our workshops. 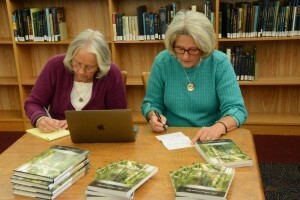 We are currently busy with book signings and presentations. We believe sharing with each other is so critical for all of us. We are happy to help anyone that might be searching for more meaning in their lives. 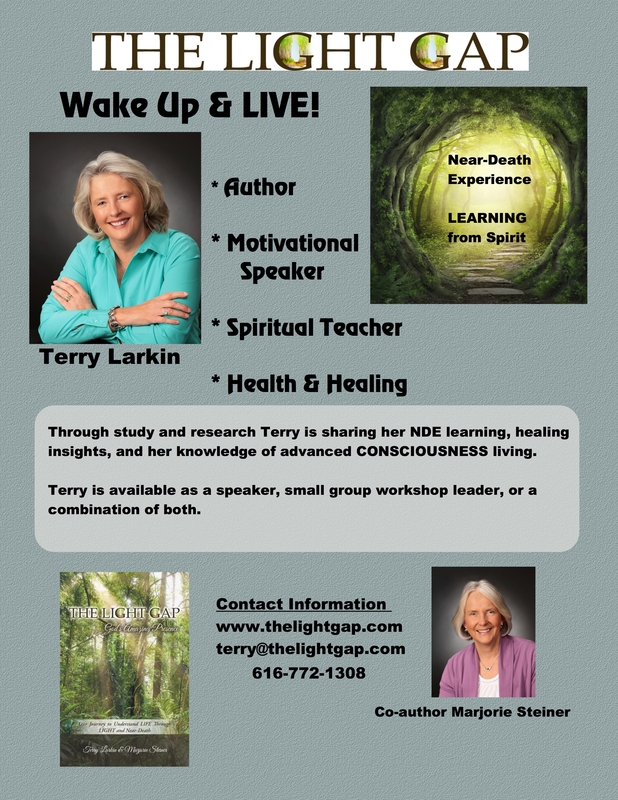 Perhaps you have had an NDE experience of your own you would like to share or ask questions concerning the event. We will be blogging about many of the authors we have read who have experienced NDE’s and why certain people’s accounts were so meaningful in our lives. Or you might have had an usual light event similar and yet different to Marj’s and would like to share it with us. Perhaps you have had a tragic event in your life and are wondering how to begin turning your thoughts from negative to positive. You might need a CONNECTION to an expert on spiritual growth for you or a loved one. Let us know in what area you are searching and we will share from our years of searching for answers. We can connect you with an author that might be very helpful for your particular situation. Or you may just have a general comment on our blogs. We appreciate your feedback. Let us know who you are and we will answer back soon!